Have we reached a tipping point for technology? It doesn’t feel like a revolutionary moment. A member of a small team from the Swiss bank UBS, holed up on the 42nd floor of London’s Canary Wharf, taps a screen and a bond is sold by a company called ABC to an investor called XYZ. It is the type of transaction executed millions of times a day by banks globally but this dummy transfer is different. It was completed via an internal blockchain, the shared database technology that gained notoriety as the platform for the crypto currency bitcoin. 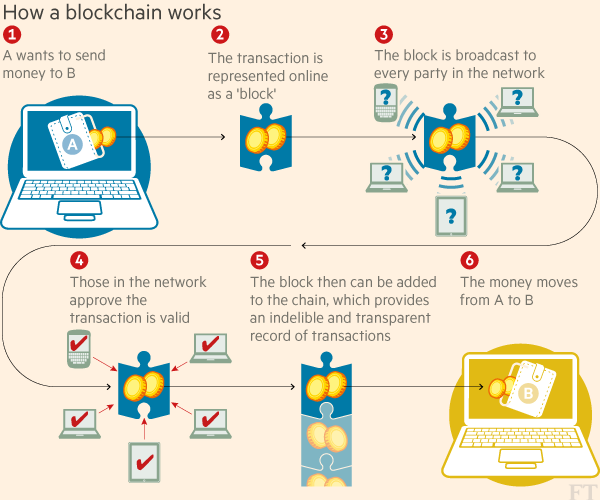 Banks are now racing to harness the power of the blockchain technology, in a belief that it could cut up to $20bn off costs and transform the way the industry works. UBS is not alone. Its skyscraper laboratory is part of a huge experiment taking place across several industries that is most pronounced in the finance world. Banks, insurers and companies ranging from IBM to PwC are trying to work out how they can adapt the technology that, in its simplest form, allows consumers and suppliers to connect directly and form online networks, removing the need for middlemen. For the financial services sector it offers the opportunity to overhaul existing banking infrastructure, speed settlements and streamline stock exchanges, although regulators will want to be assured that it can be done securely. The developments potentially combine two of the most dynamic industries: the computing hub of Silicon Valley and the money management of Wall Street and the City of London. Blockchain has been hailed by admirers as holding the revolutionary promise that the internet did two decades ago. Business figures from Microsoft’s Bill Gates to Richard Branson, the founder of the Virgin Group, have extolled its potential; on a trade mission to Asia in August, David Cameron, the UK prime minister, included a blockchain expert among his entourage. Evangelists say the possibilities are limitless. Applications range from storing client identities to handling cross-border payments, clearing and settling bond or equity trades to smart contracts that are self-executing, such as a credit derivative that pays out automatically if a company goes bust or a bond that regularly pays interest to the holder. Some go as far as to suggest that the technology even offers the potential to disrupt companies that have forged reputations as “disrupters”, such as Uber and Airbnb. At its core, blockchain is a network of computers, all of which must approve a transaction has taken place before it is recorded, in a “chain” of computer code. As with bitcoin — the first application of the technology, applied to money — cryptography is used to keep transactions secure and costs are shared among those in the network. The details of the transfer are recorded on a public ledger that anyone on the network can see. In the present system a central ledger is likely to act as the custodian of that information. But on a blockchain the information is transparently held in a shared database, without a single body acting as middleman. Advocates argue that trust is increased among the parties, as there is no possibility for abuse by someone in a dominant position. The lack of a central authority is the very feature of bitcoin that provoked consternation among traditional financial institutions, most of whom gave it a wide berth. The wisdom of that seemed to be borne out when the crypto currency became bogged down in scandals ranging from its links to drugs money in the now-defunct black market website Silk Road to the disappearance of client assets at the collapsed bitcoin exchange Mt Gox. Yet almost every big financial services institution has now overcome that initial suspicion. And the technology has swung from being a weapon wielded against the banks to being heralded as their ultimate back-office makeover, a bitter blow to the libertarians who conceived the idea of the blockchain to circumvent the global banking system. “Suits are replacing hoodies and ripped jeans at blockchain conferences,” says Mark Buitenhek, head of transaction services at Dutch bank ING, which has hired a team of specialists to examine ways of using the technology to increase speed and cut costs in payments and trade finance. Experiments, initially conducted in secret, have begun in earnest over the past year. The desire to make a success of the technology, also described as a “distributed ledger”, is huge. It offers major rewards: cutting out inefficient banking intermediaries could save billions for consumers and the financial services industry, enthusiasts claim. The technology could cut banks’ infrastructure costs for cross-border payments, securities trading and regulatory compliance by $15bn-$20bn a year from 2022, according to a recent report by Spanish bank Santander, management consultancy Oliver Wyman and venture capital investor Anthemis. For big banks, scrambling to modernise their often outdated IT systems in the face of pressure from regulators, digital challengers and cyber criminals, blockchain represents an opportunity to rethink much of what they do. The ability of the technology to provide an unforgeable record of identity, including the history of an individual’s transactions, is one area being eagerly explored. Intermeshing records could prove highly useful, insurers believe, in cross-checking an individual’s actions. Governments are also investigating its potential: Honduras is using blockchain to handle land titles while the Isle of Man has begun testing the technology with a registry of companies on the island. Longer term, a tamper-proof ledger could be used to hold medical records or develop transparent electoral voting systems. Some have developed in-house models, such as Citigroup’s creation of Citicoin, a digital currency being tested in the bank’s laboratory. Others have chosen to invest in a specialist: Goldman Sachs led a $50m funding round for Circle Internet Financial, which aims to use bitcoin to handle consumer payments. A third route has been to find a partner. Commonwealth Bank of Australia has teamed up with open source software provider Ripple to build a blockchain system for payments between its subsidiaries. Some banks, like Barclays and UBS, are working with blockchain start-ups through a technology incubator or accelerator programme. UBS has a team of eight working in London’s Canary Wharf alongside start-ups in what it calls its Level 39 incubator — they graduated to the 42nd floor as the project grew. The collaboration, to investigate bond trading and the creation of its own currency, exposes a major problem that financial institutions are grappling with: whether membership of a distributed ledger network should be invitation only, and therefore more controlled, or not. Bitcoin’s open source blockchain, described as a “permissionless” system, means it is decentralised and open to anyone. UBS and Microsoft are both working with blockchain start-up Ethereum, which runs a similar open source technology, and allows for the smart contracts that can execute trades automatically. But many in banking, wary of losing their grip over operations or of upsetting regulators, see the future in closed, or permissioned-only, networks. Almost two dozen of the world’s largest banks, including JPMorgan, UBS and Barclays, have thrown their weight behind R3 CEV, a start-up venture, to set up a private blockchain open only to invited participants who between them maintain and run the network. It forms part of an effort to build an industry-wide platform to standardise use of the technology. “This isn’t going to happen with everyone working on their own: it’s got to be collaborative,” argues Hyder Jaffrey, head of the blockchain team at UBS. There are about 300 technology start-ups, mostly in the US and UK, developing ideas for how to make blockchain work for financial services, according to PwC. Many of them are run by former senior executives at big banks, for example Blythe Masters, formerly from JPMorgan and now leading the blockchain start-up Digital Asset Holdings. Venture capital has poured into the sector according to Coindesk, a bitcoin trade publication, with an estimated $462m committed between January and September this year, double the amount raised in the same period of 2014. Amid the fervour there is a recognition that it will be between two and five years before real-world, practical applications emerge. The technology will have to overcome serious hurdles to prove itself to be robust and secure and will need to win regulatory backing. Vitaly Kamluk, principal security researcher at Kaspersky Lab, which advises clients on digital security, argues that the decentralised nature of distributed ledger technology has still to be reconciled with how such databases can be maintained cleanly and securely. In June, the US Securities and Exchange Commission agreed a $20,000 settlement with California’s Sand Hill Exchange for offering trading in derivatives linked to private Silicon Valley companies, using the blockchain for settlement. The SEC ruled that Sand Hill was “illegally offering complex derivative products to retail investors”. Other reactions have been warmer: the Bank of England is studying the technology and said in a recent paper that “it may be possible in the future — in theory, at least — for the existing infrastructure of the financial system to be gradually replaced by a variety of distributed systems”. The technology is already handling a brisk business. On an average day more than 120,000 transactions are added to bitcoin’s blockchain, representing about $75m exchanged, according to blockchain.info. There are now 380,000 blocks; the ledger weighs in at nearly 45 gigabytes. But it still has a long way to go before it can prove itself in the world of finance. For instance, it is not yet clear that the technology can be scaled up in an efficient enough way to meet the challenge. Image: An illustration picture shows a projection of binary code on a man holding a laptop computer. REUTERS/Kacper Pempel.